In my new position I am supporting students in different buildings, with different disabilities, different accommodations, etc. This makes my job VERY fun and I love it! Anyways, the one thing that I keep running into when I go to work with students is that a break and a reward are used interchangeable. Let me be clear they are NOT the same thing! This week I have had the pleasure to work with a student who needed a behavior support plan implemented in the general education classroom. When I arrived I asked him about his plan: what his rewards were, what his breaks were, where they took place, etc. The thing that got me was he could not tell me what his rewards were and his breaks were playing basketball or the iPad. These sounded more like the reward to me. I explained to the student the difference between the two things! What I explained to this child was a break is something we do to help calm our body and help us return to class. A reward is something you have earned as a result of your good behavior. When working with students I like to use visuals that will help us create a menu of choices for them. I find it extremely useful and important to include the student in this process. When I start this process I have my list of ideas (which you can find below) and I talk to the student and ask them if this will help them calm down. Depending on the student and the situation I will steer them into the breaks that will help them specially by asking questions like "Does this calm your body?" or "I don't think this calms you down so it really isn't a good break choice." When I work with students breaks are a short amount of time, generally 3-5 minutes, depending on the student. I set the timer and if after the 5 minutes I can tell that the students body isn't ready to return to class I will say something like "I see your body isn't ready for class I think we should choose another break choice to see if that helps calm your body." Set the timer again and tell them that after this break they will be returning to class. There are always students who will require longer to calm down and you will get to know who those students are by observing their breaks. There are also students who will abuse the break system and in those situations I give those students a specified number of breaks per day or class period. once the breaks are gone they are gone, UNLESS a teacher tells them they need a break. I always write social stories for kids and this is always included that important point in that social story. 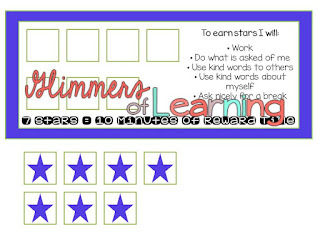 Rewards are something the student has earned because they have completed work or their behavior plan. For this student we implemented a star chart (see sample below) and once he has received the seven stars he gets a specified amount of reward time. The moment a student successfully asks for a break GIVE THEM A STAR OR TIME TOWARDS A REWARD. You need to teach them how to successfully use a break. This is a difficult skill to learn! I will blog more about this in another post! Rewards are anything that motivates a student! This can vary VASTLY as we know that students are motivated by different, and sometimes odd things! I think it is important to put a time limit on rewards. Anywhere from 3-10 minutes. My goal on rewards is to reward the students behavior and get them BACK into class as soon as possible! It is also key to get the student involved in this process. Give them the power to choose the rewards and again you may need to help them realize that this isn't a reward they can achieve during school but help them come up with some good choices for school rewards! Watching a short video (You tube is your friend!) There is a You Tube Kids version! If a student is unable to stop their reward when the timer goes off I remind them that if we can't stop that this reward won't be a choice tomorrow or the next time. If the problem persists I suggest it not ever be a reward choice. Also reward the student for stopping the reward. With praise, stars, or whatever the behavior plan is! This will ensure that they want to stop the reward so they can work for another reward! I hope this cleared up the difference between a reward and a break as they are SO different and both equally important!